There's something strange happening on GILEAD LANE. A mysterious new neighbor has everyone talking! But what's the real story behind the rumors? It's the town's biggest mystery and the Morrison kids want to know the truth about that CRAZY GRACE. From the first episode – you'll get to know the Morrisons! They're a family trying to live by God's Eternal Word, while dealing with life's everyday challenges. You'll be there when Brooke stresses out about her first day in high school – or when Michael tries to be nice to the meanest girl in school. How does God help them through it all? That's what you'll discover - DOWN GILEAD LANE. Season One gets you 13 exciting and fun episodes – each with special message for today's family! 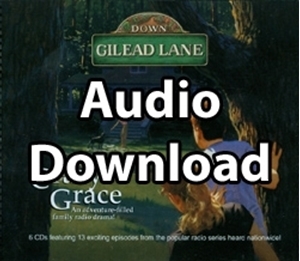 DOWN GILEAD LANE is recorded and mastered in full digital stereo with a full musical score and a professional cast!